PrecisionAg Professional Editors Matthew Grassi and Paul Schrimpf list unmanned technology as one of the 10 most intriguing technologies in agriculture. 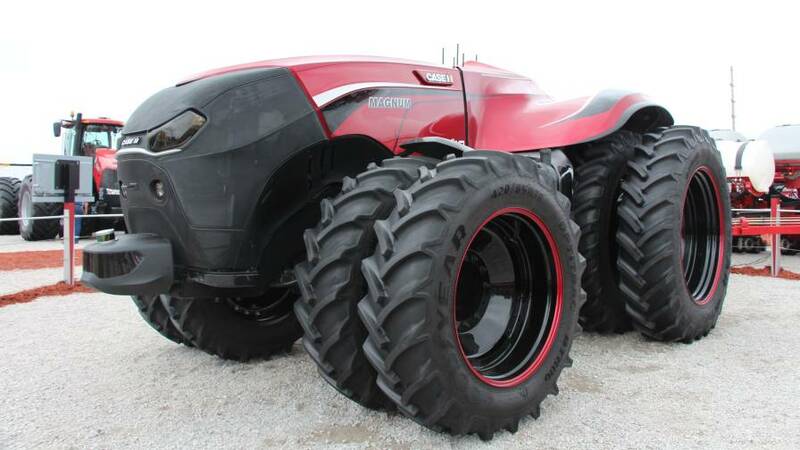 Pictured is the autonomous concept tractor from Case IH. This may be a bit of stating the obvious here, but we’ll throw it out there anyways: as much as some of us may fight it, we journalists are unequivocal #List Nerds. Listicles, Top 10s, “Best-Ofs”. Websites like Buzzfeed and Huffington Post basically made the leap to mainstream media status all on the strength of their respective Listicle format. No matter what you call them, we writers love brainstorming them, arguing over what to include and what to leave out, and then seeing how they are received by the ultimate target audience for these lists: you, the reader. Many of the “cool” new technologies being made available to agriculture have a hard time finding practical applications that add value. On its face, machine learning — the ability of a computer to accumulate knowledge about an action or a thing and begin to “make decisions” on its own — would have broad applications in ag. And it could; but the devil is in the details. Tasks that seem relatively simple often end up having multiple layers that add complexity in a hurry. With its See & Spray technology, startup tech company Blue River started by identifying a singular issue of great concern — herbicide-resistant Palmer amaranth — and developed a machine that can “learn” to identify and spray Palmer on the go utilizing machine learning. In testing mode in the Southeastern U.S. this year, it is scheduled to move to production in 2018. The term the Internet of Things (IoT) has a very Silicone-Valley vibe, but its potential benefit to agriculture should be clear. Essentially, it’s connecting all the disparate devices we use in the field to monitor and measure the work we do, and making the information they provide fully accessible. We’re already using it. We monitor fuel tank levels, soil moisture, water meters, rainfall, weather stations, irrigation pumps, and cattle biometrics today, and access the information from smart phones. “These new technologies can already help improve operational planning and accelerate decision making on farms, large and small,” says Paul Welbig, Director of Business Development in Agriculture at Senet. As more solutions are built and deployed, there’s no doubt we’ll see even more advantages develop from the IoT in agriculture. 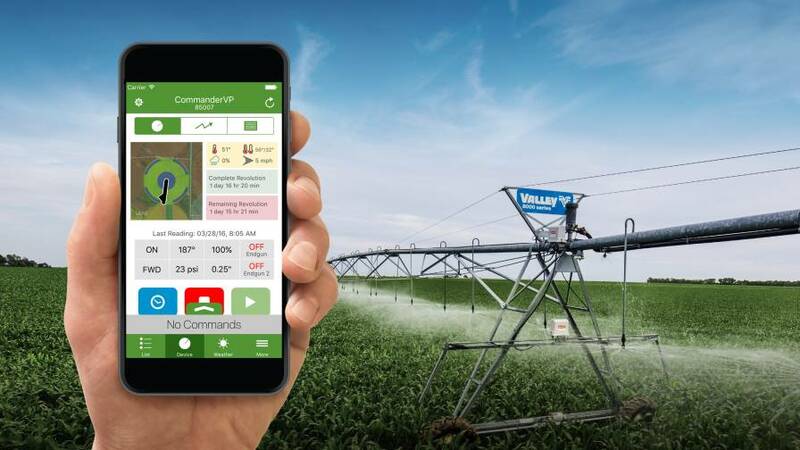 Irrigation manufacturers are working on building connectivity with other types of field sensors to help end-users make more comprehensive agronomic decisions. When it comes to employing technology that improves control and efficiency, irrigation is arguably the farthest along in the ag industry. Systems that serve up status reports on pivot performance, soil moisture sensing, weather, and other field data to mobile phones and computers are commonplace, and providing end-users with on-the-go tools to make and implement irrigation management decisions. And the future is even brighter for irrigation control. Manufacturers such as Valley and Lindsay are working on building connectivity with other types of field sensors to help end-users make more comprehensive agronomic decisions, says Nebraska farmer and irrigation expert Roric Paulman. 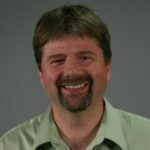 “The fact that these manufacturers are willing to open up and be connected is really big news for agriculture.” Paulman says that much more is in the works that will provide information to end-users that will improve decision making both from an irrigation standpoint, as well as overall agronomy. Fertilizer is still by far the biggest revenue generator for retail service providers — and has in recent years become arguably the most scrutinized input in agriculture. Along with a variety of stewardship initiatives have come commercial programs that monitor and improve nitrogen efficiency — programs that are really beginning to show their mettle. As the market continues to move away from the single fertilizer application approach toward multiple in-season applications on an as-needed basis, nitrogen management solutions have evolved to help retailers make the best possible decisions about rates and timing to ensure the most efficient application is being made. 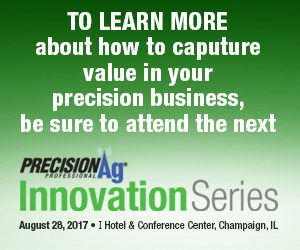 Systems such as 360 Yield Center and Adapt-N are gaining traction and providing a clear path to better nutrient efficiency. Dynamic, flexible solutions provide “actionability,” he says, allowing end-users to understand the data and make adjustments to programs and recommendations on the fly. 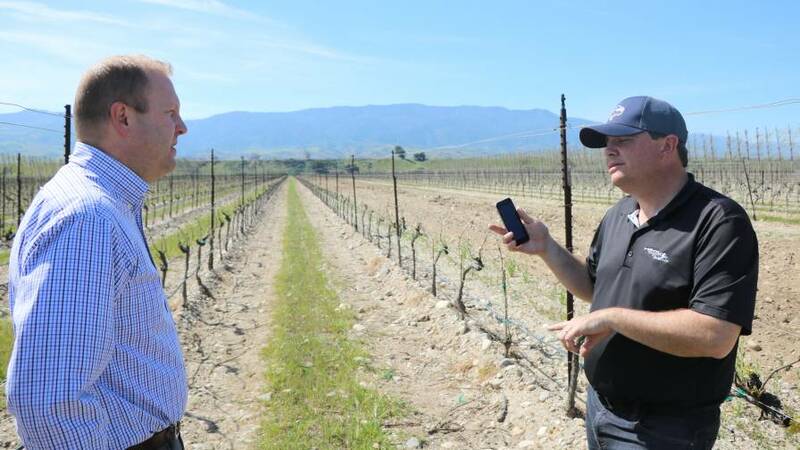 Zabala Vineyards is one of many grape growing outfits in California that deploys EC sensors throughout its vineyards to right-size irrigation schedules, according to Manager Jason Melvin (right). Zabala Vineyards (Soledad, CA) is one of many wine grape growing outfits in California that deploys EC sensors throughout its vineyards to right-size irrigation scheduling. Dealing with a range of soil types from sandy to basically growing grapes in a Fred Flintstone-esque gravel pit, it’s these data layers that allow Vineyard Manager Jason Melvin to tailor his irrigation schedule to each individual wine blocks’ soil type. “With those EM-38 EC values we like to use that to set our plant available water metrics in real-time, and we use that data to direct our soil sampling program. And all of that is used to design our irrigation system and schedules for the year,” Melvin explained during our 2017 California Ag Tech Tour. Drone manufacturers are edging ever-closer to the coveted 1,000 acres-on-a-single-battery ceiling. Pictured is AeroVironment’s Quantix vertical-takeoff quadcopter/fixed wing mashup. OK, so maybe drones haven’t quite taken off from an adoption standpoint in precision agriculture, YET. Let me be the first to say: Congratulations skeptics, hot takers, and grumpy naysayers in general. Yes, it must be admitted that scaling the technology to fit (in a way that makes the most dollars and sense) into grower-facing precision services programs down at the dealership has proven quite challenging. Still, even Sally Skeptic has to admit that there have been some exciting developments in the drone space as of late. 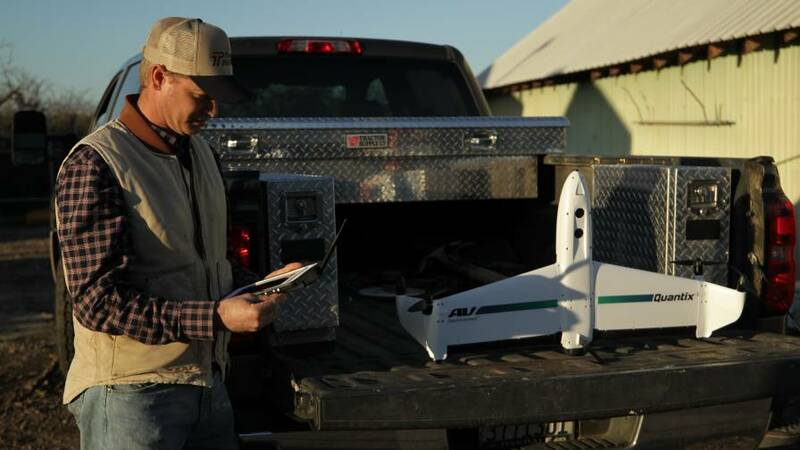 Firstly, ag-focused drone manufacturers like AgEagle with the AgEagle RX48 (300 acre coverage on a single battery charge) senseFly with its eBee SQ (500 acres), AeroVironment’s Quantix vertical-takeoff quadcopter/fixed wing mashup (400 acres), and Sentera’s Phoenix 2 (700+ acres) are all edging ever-closer to the coveted 1,000 acres-on-a-single-battery ceiling. Then there’s the work that Minnesota-based startup Sentera has done in making high-resolution NDVI/NIR sensing packages available for some of the cheaper consumer-focused platforms like DJI’s uber-popular Mavic and its Phantom4 Pro flagship quadcopter. So maybe drones haven’t set the agricultural world on fire just yet. Even though I am a commercial drone pilot myself, I have no problem making that admission. Give these companies a couple more years of R&D work, though, and those expensive flying robots just might start covering enough ground in one flight to make service providers pull the trigger. As longtime friend to PrecisionAg® Professional Jeremy Wilson explained to me at our inaugural Vision Conference in Phoenix in October, the potential of driverless vehicle technology to completely revolutionize how business is done in this country goes far beyond just the farm gate. Advancements in this field will change the way that we live in ways that many of us have yet to fully fathom. I literally couldn’t have said it better myself, Jeremy. One thing many in precision ag have struggled with for years is how to collect data on what’s happening in the seed trench. One method many have used in years past was simply grabbing a flashlight and notepad, getting down on one’s hands and knees and taking visual observation notes on how moist the seed trench appeared, or how much soil organic matter one could sense with the human eye. An imperfect process that would surely suffer from subjective interpretation (ie human error) of current conditions. For service providers, one must consider the potential to drive new revenues by marketing seed trench sensing as an add-on to existing precision programs. Not only does it clearly demonstrate to growers a higher understanding of soil-seed interaction dynamics, it also shows customers your precision programs embrace a service-focused leadership role by implementing the latest cutting-edge data capturing technologies. It’s at least worth a thought, that’s all we’re saying. Although it debuted at the massive 2017 National Farm Machinery Show in Louisville, KY, back in February, my first look at the New Leader NL5000 G5 Dry Nutrient Applicator with Swath Width Control (jointly developed with Ag Leader) came a couple weeks later in San Antonio, TX, at the 2017 Commodity Classic. By that time, many of our trusted advisors within the industry had already called or emailed to make sure we understood just how impactful this newest New Leader innovation had the potential to be. Basically speaking, the G5 allows applicators to achieve “pinpoint application accuracy with a spinner-spreader,” and it also includes a sustainability aspect in that it helps keep dry dispersible fertilizer granules from being placed off-target, specifically in end-rows and edge-of-field areas where only one side of the spinner needs to be running. “The G5 brings an unprecedented level of precision placement to operators, and gives them reassurance in knowing that nutrients are being placed where they need to be,” said Rocki Shepard, HECO President and CEO. 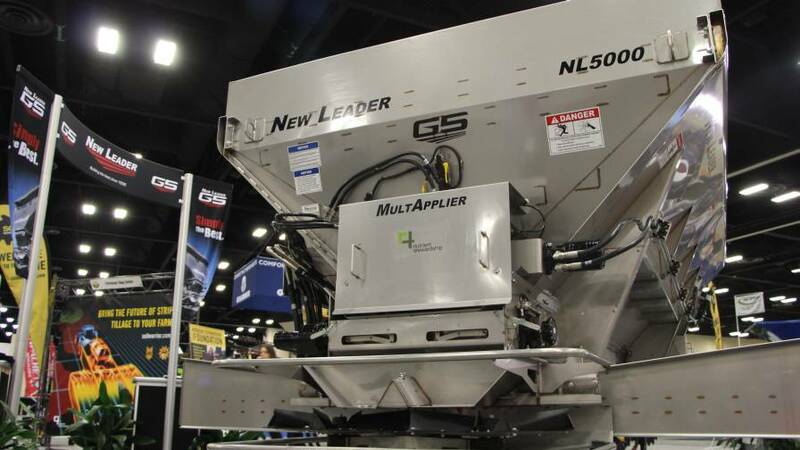 If somehow you missed the New Leader NL5000 G5 on the winter equipment show circuit, take some time at MAGIE or Farm Progress this summer to learn about the machine and its capabilities, especially if you custom apply dry fertilizer for customers. There’s no shortage of speculation on how robotics could positively impact the production of food, in particular high value crops that require intensive labor to care for and harvest. Today, with labor availability becoming a bigger concern within the commercial tree fruit industry, the interest in robotics is driving a fresh wave of interest and urgency into robotics development, says Christina Herrick, editor of American Fruit Grower magazine. First up is harvest robots for apples.